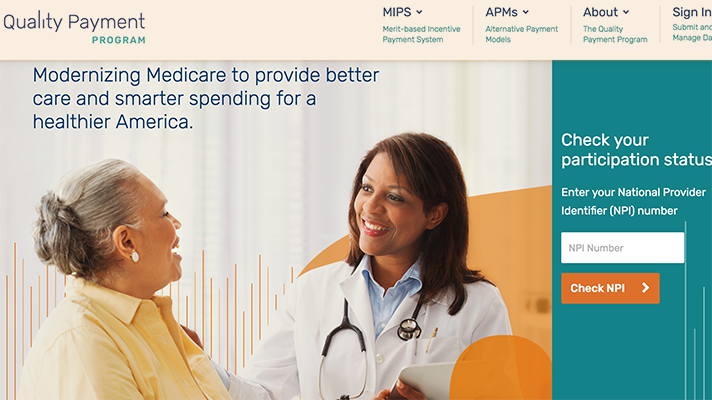 The Centers for Medicare and Medicaid Services has launched a new website to help physicians and eligible clinicians taking part in the Quality Payment Program more easily submit 2017 performance data. “While under the various legacy programs (for example, the Physician Quality Reporting System and the Medicare EHR Incentive Program for Eligible Professionals), you had to submit performance data using multiple systems. However, under the Quality Payment Program, we streamlined the data submission process and created one system for data submission,” CMS said. Officials also said the portal at qpp.cms.gov offers improved usability compared to past CMS procedures, which required participating clinicians to submit data on multiple sites. "The Medicare Access and CHIP Reauthorization Act of 2015 requires CMS to implement the Quality Payment Program, and we are committed to doing so in the least burdensome way possible," said CMS Administrator Seema Verma, Administrator of CMS. "The new data submission system makes it easier for clinicians to meet MACRA’s reporting requirements and spend more time treating patients instead of filing paperwork." With the new system QPP participants can submit 2017 performance data during the 2017 submission period – which runs until March 31, 2018 (except for groups using the CMS Web Interface whose submission period is January 22, 2018 to March 16, 2018). After logging in to the system, each eligible clinician will be connected to the taxpayer identification number associated with their National Provider Identifier, according to CMS. Program participants will report their data either as an individual or a group. CMS offers multiple data submission options, including qualified clinical data registries, attestation or the CMS Web Interface, according to the agency, and eligible clinicians can also submit data using their IT vendor via certified EHR technology. Officials said program participants can generate a non-certified report in either the new Quality Payment Program file format or QRDA III file format and manually upload the file into the submission system. As data is submitted to the new system, providers can see real-time scoring within each of the Merit-based Incentive Payment System performance categories. As new data is reported or information about new quality measures is submitted, the scoring reflects the change. Data can be updated at any time during the submission period. Once the QPP submission window closes on March 31 (March 16 for those using the CMS Web Interface), the agency will calculate payment adjustments based the most recent submission or update.